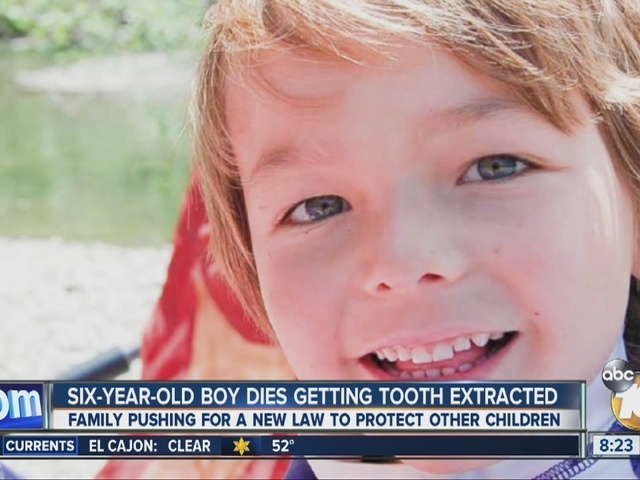 SAN DIEGO -- A California family is pushing for a new law that would protect other children from suffering the same fate as their six-year-old son. Tim Sears had big dreams for his six-year-old son Caleb, but the young boy's life ended too soon. "We miss him every day. We wish we had the information to make the right decision," said Sears. In March 2015, Sears and his wife Eliza took Caleb to his oral surgeon's office near Berkeley, Calif., to have a tooth extracted. Caleb stopped breathing after the oral surgeon administered general anesthesia. The oral surgeon had recommended general anesthesia, because Caleb had an extra tooth embedded in his palate (called supernumerary tooth) that would affect how his permanent teeth would come out. The family says Caleb needed to be sedated since the oral surgeon needed to drill into his palate. "They didn't catch it when he stopped breathing and until his oxygen levels had dropped too low and he went into cardiac arrest," said Sears. Caleb suffered massive injuries and died. His family says he'd still be alive if there had been a second professional in the room not only trained to administer anesthesia but whose sole job was to monitor Caleb during the procedure. "The fact that there's increased risks when there's not a separate person doing the anesthesia as doing the procedure was not disclosed at all," said Sears. To change that, the family is pushing for Caleb's Law. 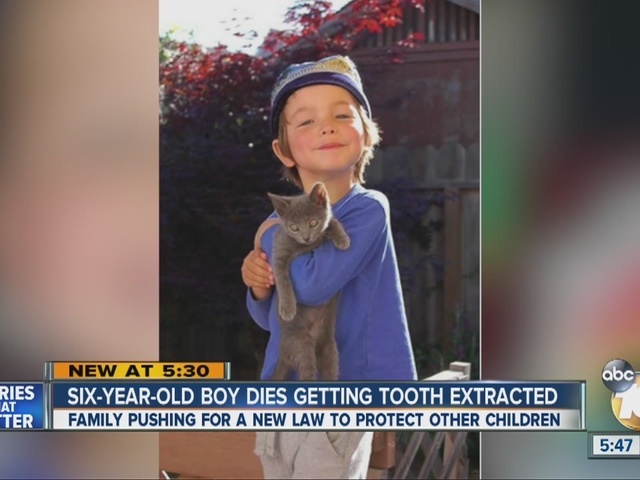 On April 5, a committee in the state Assembly in Sacramento will consider AB 2235, a bill the family says will take the first steps toward improving patient safety in dental and oral surgeon offices. If a law is passed, dentists and oral surgeons would be required to inform parents of the increased risk when general anesthesia or deep sedation is provided without a separate anesthesia provider or without the recommended monitoring equipment. "The fact that dentists and oral surgeons are allowed to do this and no one else is doesn't make sense," said Sears. The bill would also require the California Dental Board to collect, study and share data about deaths and injuries from dental anesthesia. 10News found out about the family's efforts from Caleb's cousin, Kendra Riches, who lives in San Diego. She shared Caleb's story on social media hoping San Diegans will call their Assemblymember urging them to support Caleb's Law. In San Diego, Assemblyman Brian Jones is on the committee that will review AB 2235 next week. "Our whole family wants something positive to come from Caleb's death," said Riches. Caleb was a healthy six-year-old, in his first year of elementary school and just starting to read and write. He loved playing with his little sister. "He was a special little boy. We miss him so much and he didn't need to die," said Sears. Now, his family wants to prevent what happened to him from happening to other children. To learn more about Caleb's Law and who to call to express your support, visit www.calebslaw.org . The Dental Board of California is currently investigating whether the state's laws, regulations and policies are sufficient in protecting children under anesthesia during dental procedures. The board is responsible for licensing and laws regarding the practice of dentistry. The American Dental Association emailed 10News a statement that read, in part: "Dentists use pain and anxiety control techniques to treat millions of patients safely every year. Even so, the administration of sedation and anesthesia involves a certain amount of risk. The educational and training requirements to administer sedation and anesthesia are regulated by the state dental boards. The ADA makes its anesthesia guidelines for the teaching and use of sedation and general anesthesia available as a resource to the dental community and the state dental boards to assist them in developing their regulations. In the case of children 12 and younger, the ADA's sedation and general anesthesia guidelines direct dental professionals to the guidelines from the American Academy of Pediatric Dentistry, which were created specifically for children."